In May 1942, when a seemingly invincible Nazi Germany controlled all of Europe and its disastrous invasion of the Soviet Union was only months away, a group of Czech and Slovak commandos were dropped from a British plane to the Czech countryside. They were on a daring mission to assassinate Reinhard Heydrich, the feared SS General and an architect of The Final Solution — the planned extermination of Jews. Heydrich had been sent to Prague to quash the bothersome Czech resistance. Both then British Prime Minister Winston Churchill and Edvard Benes, then Czech president-in-exile in London, wanted a propaganda victory by striking at the Nazi empire. What was considered a good idea from afar in London wasn’t considered so in Prague. 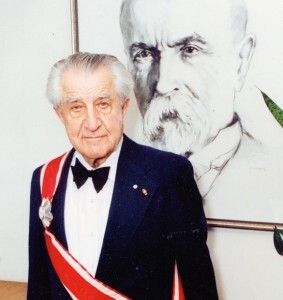 Vladimir Krajina, the leader of one of the most effective Czech resistance groups, believed that success would bring such severe German reprisals that it would jeopardize information-gathering abilities. Krajina met the commandos and tried to convince them to abandon their mission. The mission went ahead as planned and Heydrich died in June. Just as Krajina predicted, the response was brutal. The Nazis embarked on a campaign of mass executions that caught Krajina’s brother Emmanuel in its web. Krajina felt guilt over his brother’s death for the rest of his life. Krajina’s remarkable life is the subject of a new biography by B.C. writer Jan Drabek, the author of 17 fiction and non-fiction books. Drabek is a fellow Czech, who was a close friend of Krajina’s. In Czechoslovakia, it was Drabek’s father who introduced Krajina to the resistance movement. After the war ended, Krajina fled Czechoslovakia and came to Vancouver where he had a long career as a respected botany professor at the University of British Columbia. Drabek’s biography isn’t a dry, objective recounting of the facts. As a contemporary account of a man’s life that foregrounds the narrator, it also includes Drabek’s own voice and his somewhat confusing childhood memories about Krajina. During his years in the Czech resistance, Krajina was obsessed with secrecy. While most resistance fighters had two code names, Krajina had 11, reasoning that the more aliases, the more confusion it would sow among the Nazis. The Gestapo was so anxious to shut down his network they arrested and imprisoned his wife Marie in Ravensbruck concentration camp in the hope he would give himself up. It didn’t work. Krajina had a number of close calls. The closest came one day while he was on the run from the Gestapo and he had to zigzag through a potato field as shots whizzed by. Only later did he discover how close he’d come to being killed when he found a bullet hole in his hat. After the Heydrich assassination, the noose tightened around Krajina. When he was captured — and his wife Marie released — Krajina tried to commit suicide by swallowing a vial of arsenic but because he’d been carrying it around in a container that wasn’t airtight, it had lost most of its potency. It did have one unusual effect: for a short while, he saw everything like a photographic negative. Imprisoned in Theresienstadt for 27 months, Krajina was released at the end of the war when the Soviet Red Army occupied Czechoslovakia. Krajina then became a leading public figure and democrat involved in the fight against the other totalitarian movement of the 20th century — Communism. As his influence increased and the communists were eliminating the opposition, he was smeared as a wartime collaborator. Once the new Communist government took power, Krajina was arrested, imprisoned and threatened with execution unless he was willing to become a spy in the west. Thanks to the determined intervention of his wife, Krajina was released. He was advised to leave the country and arrived in Canada in 1949 with his family and started work at as a special lecturer at UBC. He was a teacher in the European style, which meant he believed he should be treated with a certain amount of respect. He preferred to be called Doctor or Professor. Getting to be on a first-name basis with Professor Krajina took a long time. Krajina’s ecological approach brought him attention outside of B.C. He was the subject of documentaries in Czech and English, including a 1978 National Film Board film. One of his students was Patrick Moore, one of the early members of Greenpeace, who credits a noon-hour lecture by Krajina for changing his life and turning him into a novice ecologist. While he was at UBC, Krajina spoke out about clear-cut logging and slash burning, raising the hackles of some B.C. forestry industry leaders. Although they called for his dismissal, the university stood behind him. Krajina was instrumental in establishing B.C.’s network of Ecological Reserves to preserve unique plants, animals or ecosystems. The 148 reserves in the province protect everything from Pacific rhododendrons and sea otters to oysters and ring-billed gulls. On the west coast of Haida Gwaii, one is named after him. Krajina lived long enough to see communism collapse in Czechoslovakia. He returned home in 1990, a year after the Velvet Revolution, and met then president Vaclav Havel. Three years later Krajina died at age 88. Drabek describes Krajina’s life as similar to the Walt Disney character Ferdinand the Bull, who preferred to smell the flowers rather than fight. “The flower-loving Resistance fighter may have been a thorn in the Germans’ side, but unlike many of his companions, he refused to carry a gun,” Drabek writes.